I get asked about supplements a lot and specifically, “What is the best multivitamin to use on the Feingold Diet?” We don’t use a multivitamin here for a few reasons. For one, most multivitamins for young kids (meaning ones that cannot swallow pills), are often the fruity gummy varieties, which are Feingold stage two. We try to stay away from stage two as much as possible so these don’t work for us. As well, they are often sugar laden gummies. I don’t feel my kids need any more sugar. Also, if you look at the back of the bottle, the amount of each vitamin in two gummies is minimal. For example, below I’ve listed some of the vitamin amounts found in two Lil’ Critters multivitamin gummies. These are Feingold stage two. You can get these at Sam’s or Costco. I pay no attention to the daily value. These are the government’s recommendations and I don’t think they are accurate, especially for kids that are deficient in many of these vitamins, which many of them are. These don’t even contain calcium or magnesium. Probably so they can sell it you separately, which is what they do. The amount of B-12 is 6 mcg. My DAN (Defeat Autism Now) doctor recommended 1,000 mcg, twice a day for my daughter. I give my younger two about 500 mcg of B-12 a day. The B-12 we take also contains 400 mcg of folic acid per capsule. 20 mg of vitamin C. I take at least 500 mg a day. 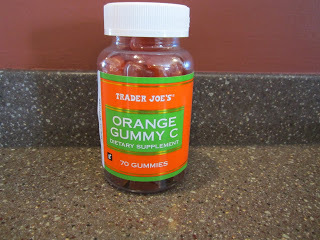 I sometimes give my kids the Trader Joe’s vitamin C orange gummies (stage two). They contain 240 mg of vitamin C in two gummies, and 3 grams of sugar. 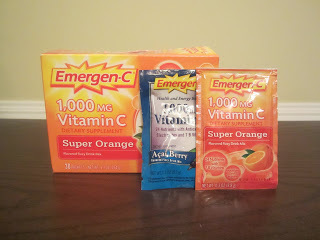 Emergen-C for Kids (the powdered mix you add to water) contains 500 mg of vitamin C. I had a holistic doctor recommend giving my kids Emergen-C for Kids every day as it contains a lot of other good vitamins as well. We can’t because it contains too many salicylates and I believe it has corn syrup. Some flavors also contain gluten. But, we do use it when my kids are sick with a bad cold or flu because it is really effective. It’s not Feingold approved but many members use it without a problem. 400 mg of vitamin D. This isn’t bad but I give my kids 2,000 mg a day. 2 mg of vitamin B6. At least 10 mg would be better. We’ve done up to 50 mg.
2.7 mg of zinc. We do 20 to 30 mg a day. 60 mcg of biotin. I give my kids about 2,500 to 5,000 mcg a day. 40 g and mcg of choline and inositol. I give my kids about 250 of each per day. And to top it off, 3 grams of sugar. That’s a lot for two little vitamins. As well, you don’t know what form all of these vitamins are in and if they are of good quality. Quality and form are definitely key. We do D3 for vitamin D. Zinc Picolinate for zinc. 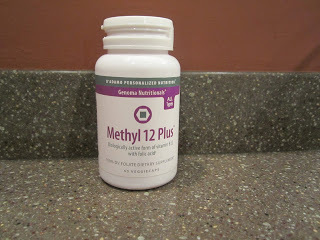 Methylcobalamin for B12. 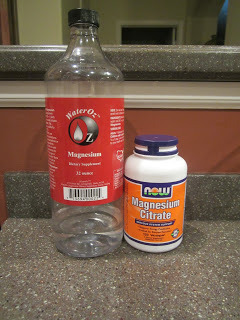 Calcium and magnesium in the form of citrate, or malate. I also like to give my kids their vitamins in ways that their bodies can absorb and use them the most effectively. 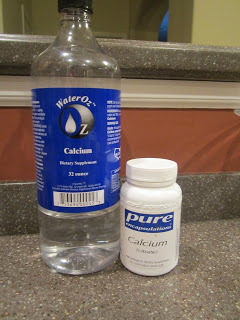 Calcium should be given with magnesium because calcium alone can cause constipation. Magnesium alone can cause loose stools. Vitamin D helps the body absorb calcium and magnesium better. Magnesium helps B vitamins absorb better so I always give those four vitamins together. Zinc should be given at least two hours away from calcium and magnesium or else they will compete for absorption. Zinc should also be given with food or it can cause an upset stomach. So, while these vitamins aren’t that bad, I give my kids much more than what is contained in these vitamins, and without the sugar and cost. I’m not sure what the cost differential is but with four kids, I think I’d be going through a lot of gummies. When I buy one bottle of the orange vitamin C gummies, they are gone within a week or two. The vitamins we take are not cheap but they tend to last a while. I also feel a lot better about the quality of vitamins my kids are getting when I buy them individually. And since there aren’t any gummy vitamins that are stage one, then what do you do? Freeda makes an unflavored chewable tablet (vitalet) that is stage one. We used it when we first started Feingold for a few years but then my kids didn’t like the taste anymore. You can call them and see if they’ll send you out a free sample. You can only get these online I believe. Or, you can buy capsules and open them up and dump them into juice or other drink. If your child only drinks water (like my oldest two), you are limited a little bit more but there are a few vitamins you can still use in water because they have the same taste and consistency as water. The problem with opening up capsules is that some vitamins have a strong taste and color to them. However, some do not. What doesn’t mix well in juice? Most B vitamins. B-6 and B-complex vitamins have a bright yellow color and a strong vitamin taste. When I add it to my son’s juice, he will give it back to me and tell me his lemonade went bad. Still looking for a suitable B-6 and B-complex not in a capsule form as they are really good vitamins. B-6 is helpful in preventing seizures which my son is prone to (he has febrile seizures). In the meantime, I found that inositol is a B vitamin and is tasteless so I went with a combination choline and inositol vitamin. Choline is great for brain development and the liver. I just got the NOW brand at my local health food store to try it out. I plan to look for a better brand the next time I need to buy it, like Thorne or Pure Encapsulation brand. The B12 we use is a light pink color and has little taste. My kids have never said anything about it but I try to divide it up throughout the day so it’s less noticeable. I also try to use a juice container that is not clear so my kids don’t notice any of the vitamins I’ve dumped in. Most of them dissolve pretty well though. 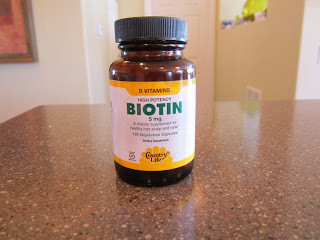 Biotin is also a B vitamin but the one we use at least (Country Life) is tasteless and colorless and dissolves well. Or you can get vitamins that are in water form like Water Oz. I get these from www.nutritiongeeks.com currently. Right now, we use their calcium, magnesium, and zinc. 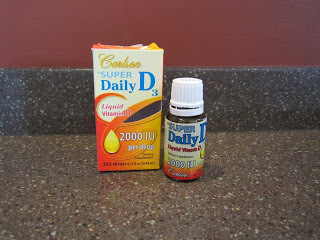 We use Carlson’s drops for vitamin D3. One drop is all you need. 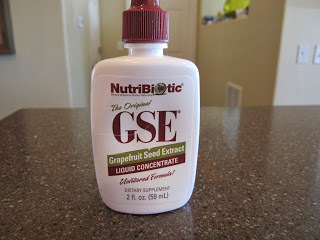 We also use GSE (grapefruit seed extract) by Nutribiotic to fight yeast. Start with one drop per day and then slowly work up if you want to fight yeast. 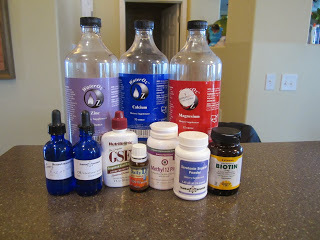 Then my holistic doctor makes homeopathic drops that contain a combination of things. 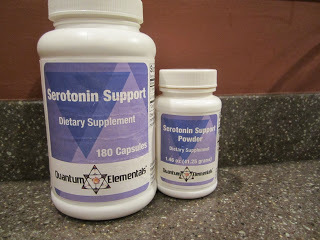 The Neurotransmitter Support one contains B-12, DMG, and a few other things. We do one dropper full every morning. It tastes like water. My kids like taking it. They act like they are birds. There are also some tablets that dissolve like DMG. It’s a very small white tablet, about the size of a flat pearl. DMG works well with B-12. Or, there are powders that you can mix into juice or smoothies as well. Most of these are going to be stage two however. I wanted to give my 2 year old a multivitamin just to make sure she was getting all of her vitamins, because the vitamins I give my kids, don’t cover everything. However, I just couldn’t bring myself to buy the gummies, even though she can do stage two. It just seemed like such a waste of money and the gummies really didn’t contain very much of anything either. So, I asked the guy at Whole Foods for his recommendations. He suggested Amazing Greens powder mix. I told him we already used that sometimes. He said it contained all the vitamins she would need in it. Hooray! And as a bonus, it is derived from whole foods – plants, vegetables, and fruits. I was relieved I wouldn’t have to give her the gummies. We use the Berry flavored Amazing Greens from Whole Foods. Keep it in your fridge. I add about a teaspoon to my daughter’s juice. She likes the flavor. It makes her lemonade taste sweeter and fruitier. I don’t use more than a teaspoon because I don’t want the taste to be too strong. I don’t use this every day just because I usually forget, but I definitely use it if my kids start to get sick. If you have a toddler, I would start off with a lower amount and work up as there are a lot of fruits and veggies in it and you don’t know if your child has any issues with any of these fruits yet. Below are the vitamins that I give my youngest two (ages 3 and 6) in their watered down lemonade (Simply Lemonade) every day. Most of the vitamins are put in in the morning, but I’m pretty much always adding something to their drinks throughout the day. You can add vitamins to smoothies as well. Pear juice is another option for stage 1. We used to use Gerber pear juice. I’d prefer to have my kids drinking only water but I don’t push it when they’re little because it gives me a place to hide their vitamins until they can swallow pills if needed. Calcium and magnesium Water Oz. I do roughly 3 tsp of calcium and 2 tsp of magnesium. This is based on my DAN doctor’s recommendations. The bottle says a child’s dose is 1/4 tsp but I’ve called the manufacturer myself and they say that the dosage is set based on federal regulations/rules, but that we can go off what our holistic doctor recommends. You can also get capsules and open them up. They dissolve well. I do that when we are on vacation. You can also get magnesium into your kids via epsom salt baths. Start with 1/4 cup and then you can work up to about one cup per bath. Some people do up to 2 cups but I’m too cheap to use that much. Soak them in the bath for at least 12 to 20 minutes. They will absorb the magnesium through their skin. Epsom salt baths help with constipation and also help to detox the body. If your child gets hyper after the first couple baths, that’s just because they are detoxing. You can lessen the amount the next time, but this should lessen over time. Typically, an epsom salt bath calms and helps rid the body of harmful toxins. Whenever anyone says their child had an infraction (ate off diet), people will say to give them an epsom salt bath. 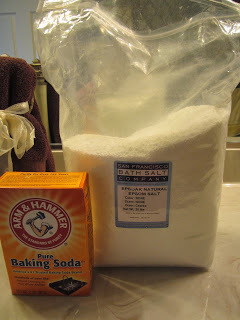 I order our epsom salt from San Francisco Bath Salt Company online. Every once in a while they offer free shipping. Right now, until the end of October, they are offering free shipping. B-12 and folic acid. I open up a 1,000 mcg capsule and dump about a quarter capsule into each of my kids’ juice. I will do this twice a day usually so that they get about 500 mcg a day each. We also have B-Fresh bubble gum or Solar Energy Gum (some are stage two – order online) which contains some B-12 as well. The moon melon flavor is stage one, as is the spearmint. We tried the cinnamon and it was way too hot, even for me. My kids like the B-Fresh bubble gum flavor the best (stage two). Moon melon is good too but the flavor doesn’t last very long at all. 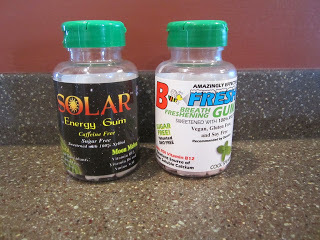 The Solar gum contains 300 mcg of vitamin B-12, and the B-Fresh contains 125 mcg. These contain xylitol so don’t let your kids eat too many of them, as too much xylitol can cause loose stools. Vitamin D3. I give them one drop of Carlson’s 2,000 mg drops. I always try to give this along with calcium and magnesium. You can do a blood test for vitamin D levels. Mine was low when I was recently tested and I eat very similar to my kids. They told me I should take 20,000 mg of vitamin D for a while. When my daughter was a baby, I gave her 400 mg a day. Carlson makes drops that come in 400 mg, 1,000 mg, 2,000 mg, or 4,000 mg.
Serotonin Support. This contains L-Tyrosine and L-5-hydroxytryptophan (aka 5HTP). A typical dose is about 50 mg. You can divide this up in two doses, one in the morning, and one at night. Start off slow with this one and work up to allow the body to adjust. My holistic doctor makes a crushed down version of this so that my kids only need about 1/16 of a teaspoon per day. I divide this into two doses. It dissolves really well and is tasteless. You can also get 5HTP in a capsule form and open it up and dump it into juice. If your child is on any medication (like ADHD or depression meds), do not take both, as they both do similar things. 5HTP helps the body make serotonin. This is important for sleep as well. My kids were tested (a blood test) for their dopamin and serotonin levels and were very low which is common in ADHD kids and people with depression so this helps with mood and concentration. GSE (grapefruit seed extract). I do one or two drops in the morning and the same in the afternoon to fight yeast. 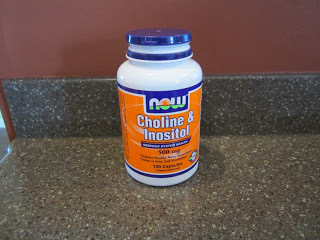 Choline and Inositol. We recently started this one. I open up a 500 mg capsule and dump about 1/4 a capsule into my kids’ juice. I sometimes do this twice a day so they get about 250 mg a day. Choline helps with memory and brain development. It also helps transport fat out of the liver. This was one supplement I had to take when I had gallbladder issues. I was also pregnant at the time. Choline is great for babies for their brain development. I’ve seen they’ve been adding it to baby formula. Inositol has a calming effect and is used to treat depression, anxiety, and insomnia. Article: What Is The Connection Between Choline and Inositol? Lysine. My daughter had warts this summer (molluscum contagiosum). I gave her 500 to 1,000 mg a day when she had the warts. They took several weeks to disappear but they are now gone. 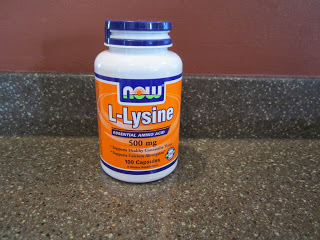 However, you need to continue with the lysine for a while after they are gone to make sure they don’t come back. The warts are a sign of a weakened immune system and the presence of one of the herpes viruses. Lysine kills viruses. This dissolves well. I dump about half a capsule in her juice now. If there is a virus going around, I will also give my son lysine. Biotin. I get the 5,000 mcg biotin from Country Life because it is a very small capsule and I open it up and only need a small amount. It’s very economical. Biotin is good for skin, hair, and nails. It also fights yeast which is why we use it. 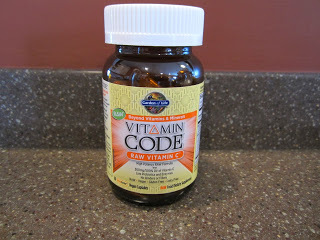 Order online for the best price on these (www.iherb.com, www.vitacost.com, www.swansonvitamins.com, etc.) My kids currently get about 2,500 mcg of biotin a day but start out with about 500 mg and work up. We’ve done up to 20,000 mcg a day when fighting yeast. 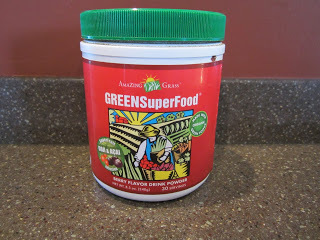 And sometimes I add 1 tsp of Amazing Greens powder mix to my 3-year old’s juice or smoothie. 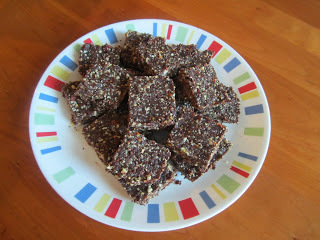 My three year old also eats chocolate energy bars which are loaded with super healthy nuts and seeds. My son doesn’t like them and they are stage two. If your kids have issues with constipation, you can use aloe vera juice. 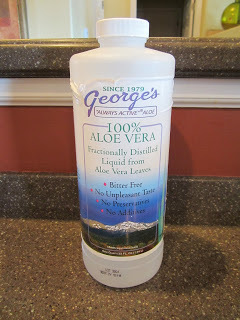 George’s Aloe Vera juice is tasteless. You use about 1 tablespoon (read the label). 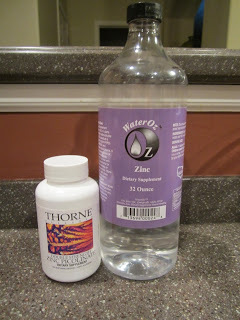 With dinner, I give Zinc WaterOz, about 2 tsp. You can also get capsules and open them up and dump them. I give about 15 to 20 mg when I do that. Give zinc with food and away from calcium and magnesium. I then add some of the same things I added in the morning, as mentioned above. Typically, I would add a small amount of serotonin, choline and inositol, B-12, and 1 or 2 drops of GSE. Some time at night, I will add probiotics alone, away from other supplements. 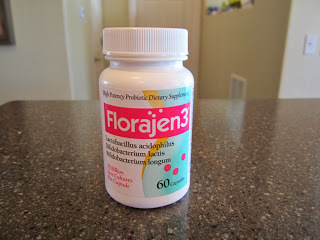 I open up a capsule of Florajen 3 which contains 15 billion. I dump about half a capsule into each of my kids’ juice. With probiotics, you want to start slow and work up. Start with about 2 billion then increase over a few weeks. If I make smoothies, I add ground flax seed to it for omegas. Nordic Naturals makes a lemon flavored chewable gel cap that has omegas and DHA, etc. My oldest son used to like them, but now none of my kids like them. You can call them and get some free samples. There’s a strawberry one too (stage two) but my daughter doesn’t like it. And for my older daughter who does not drink juice anymore, I still add the Water Oz’s to her water, as well as vitamin D and GSE without her noticing. I’ll add some other vitamins if she has a smoothie. She can swallow pills so she takes some other vitamins too. If you do have a child who can swallow pills and are looking for a multivitamin, Pure Encapsulation and Thorne are good brands (order online). However, the only down side, is the daily dose is either 4 capsules or 6 capsules. Huh? That’s a lot of capsules. I’ve tried to dump these into my kids’ juice but it has too strong of a taste due to the B vitamins. I can sometimes get 1/4 of a capsule into a smoothie but I figure why bother? It would be such a small percentage of the recommended daily dose. 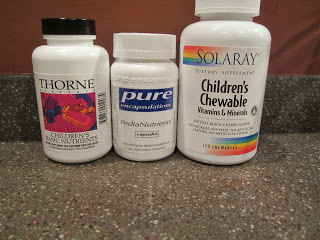 We tried the Solaray chewables (stage two) but my daughter didn’t like them. Solaray is a decent brand. And then there are chewable digestive enzymes. These aren’t vitamins, but they allow the body to better absorb the vitamins and minerals from food. These are stage two however. We use Houston Enzymes and order from them directly. 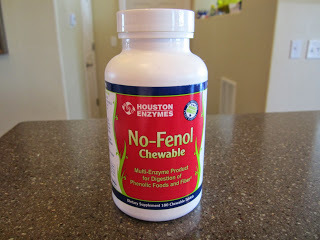 The No Fenol are sometimes used to help with an infraction. They are intended to help with the digestion of salycilates. We have not found that they help with the reactions to sals though. 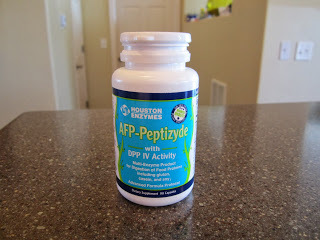 We use the AFP Peptizyde and Trienza if we are on vacation or eating out. It helps with the digestion of gluten and dairy. If you call them, they will send you free samples. So, as you can see, there is still a lot you can do with vitamins even if your kids can’t swallow pills, and you want to stay stage one. While this doesn’t cover everything, I’m hoping my kids are getting the other vitamins they need from food. Kale Chips are great if you have a dehydrator (or you can also make them in the oven). Second question I hear a lot: Are all these vitamins Feingold approved? Most of them are not, but not because I believe they contain any additives. Most of the vitamins we use are recommended by our holistic doctor or are commonly used in the biomed community (and those treating autism) which means they are free of all common allergens and anything remotely artificial. As far as I know, these are all stage one as well (other than the Amazing Greens and orange vitamin C gummies). These probably just have not been researched by Feingold yet. Where to get all these vitamins? 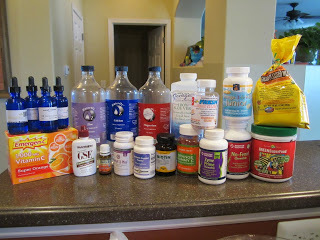 At the end of this post are a few links to previous posts where I say where I order each of our vitamins from. Some I can only get online. Others you can find at Whole Foods or your health food store. Typically, it’s cheaper to order online and on most sites, you can get free shipping if you order a certain amount. And yes, you can get all your vitamins from food, but I then I have two questions for you. Number one: Do you have kids? Number two: How do you get them to eat the massive amounts of fruits and vegetables that would be required for them to eat in order to get all the vitamins they need daily? Juicing veggies is one way if your kids will drink them and you have the time to juice every day. But, even expert holistic doctors agree that the depletion of the soil and current farming practices makes it difficult for us to get all the vitamins we need from food alone. As well, many of our kids are deficient so they need extra support now, but I don’t see them needing all of these vitamins forever. There are some vitamin manufacturers that use whole foods to make supplements and I do use some of those for myself, but they cannot be easily opened and dumped into juice without kids noticing (too strong of a taste), and they are all stage two. The one below also says it is not recommended for kids. And question number three: Can I give my child supplements when first starting the Feingold diet? Feingold members only “suggest” that you wait until you are established on the diet (at least six weeks) before starting or continuing any supplements, just so you can get a baseline. The thought is that some supplements can cause a reaction. I can see that happening with stage two supplements but most of the supplements I have listed are stage one and rarely cause a negative reaction. They also want people to see the connection between doing the Feingold diet and seeing positive results, before the introduction of supplements. So, it’s up to you what you want to do. I would start with calcium, magnesium, and vitamin D maybe after the first two weeks and then add the other supplements one at a time. I do recommend starting one new supplement at a time. Holistic doctors make this recommendation as well. You want to give the body time to adjust. Typically, they say one new supplement every four days. It’s always wise to keep a daily journal of diet and supplements to watch for reactions, good or bad, so you know which supplement is the most helpful for your kids or which might be causing a reaction. With probiotics and GSE, you may see die off reactions as the yeast die off. Read more about that here. Disclaimer: I’m not a doctor. I’m not giving any medical advice. Please see your doctor before starting on any supplements. This is what our family does, based on testing, personal research, and our holistic doctor’s recommendations. I recommend seeing a holistic doctor to have your child’s vitamin levels checked so that you can more accurately assess their individual needs. You can test for many vitamins through a urine test. Other vitamins and deficiencies (such as vitamin D, magnesium, and serotonin and dopamin levels) are done via a blood test. You can also test for yeast, bacteria, oxalates, and a whole host of other things via a Great Plains OAT test (via a urine sample). We have used Dr. John Hicks for our holistic doctor for the last 6 years. www.elementalsliving.com. He just moved to San Francisco but he does Skype so it doesn’t matter where you live. He often recommends the ONE test through Genova Diagnostics which is a combination blood, urine (complete metabolic profile), and stool test. When we had Blue Cross PPO a few years ago, they covered most of it but check with your insurance first. Never mention that your doctor is a natural/holistic doctor. If they are an MD, it doesn’t matter but my insurance tried to fight me on it because of that. Posted in Biomed, Feingold Diet and tagged All About Supplements, Feingold Diet Info. Thank you so much for your blog and for taking the time to post these amazing entries, they are wonderful and so helpful! I am just getting back to stage one for my target and know that this is what will help her! Thank you! Wow, This information has been really interesting. I am overwhelmed! I have purchased your book from amazon and I will try to go about your routines. I’ve seen a doctor in PR who is a naturopath and I am happy with some of his ideas but I still need more. Your blog has answered a few of them and I can’t wait to read your book.